Figure 2 shows the two lenses that make up Bigshot's viewfinder: an eyepiece that is attached to Bigshot's back cover and an objective lens that is mounted on Bigshot's front cover. Together with the lens in an eye, the viewfinder acts as a multi-element (compound) lens that forms a focused image in the eye that has the same field of view as the one formed on the camera's image sensor. In optics terminology, the viewfinder is afocal . That is, it neither converges nor diverges a beam of light it receives (see the rays of light in Figure 2). It only alters the direction and thickness of the beam in order to give the photographer a field of view similar to that of the camera's lens. 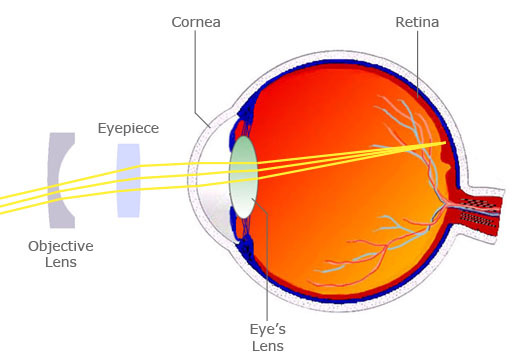 The task of focusing the incoming light to form an image on the retina of the eye is left to the eye's lens. Typically, the viewfinder is located above the camera's lens and hence the photographer and the camera view the scene from two slightly different perspectives. As a result, there will be a slight shift − also known as parallax  − in what you see through the viewfinder and what the camera captures. The parallax is larger for things that are closer. However, it reduces quickly with distance from the camera and is negligible for distant scenes. W. J. Smith, Modern Optical Engineering: The Design of Optical Systems, McGraw-Hill, 1990. "Parallax," Oct 2, 2009. [Online]. Available: http://en.wikipedia.org/wiki/Parallax [Accessed: Oct 4, 2009].